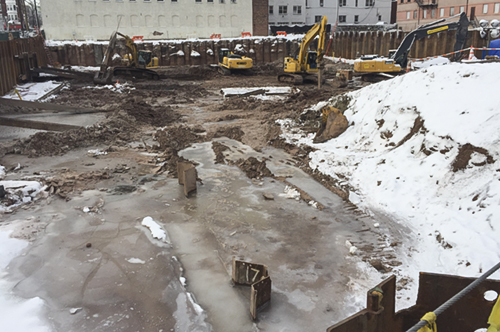 Geo-Solutions completed an in situ solidification/ stabilization (ISS) project at a former manufactured gas plant (MGP) located in downtown Newark, New Jersey. 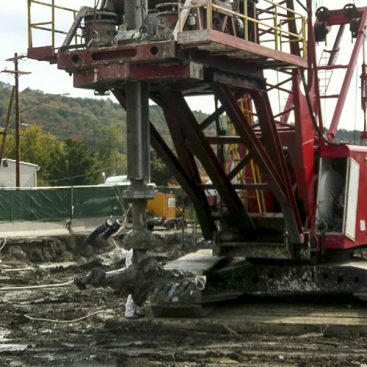 The work included ISS of 17,700 cubic yards of MGP Impacted soil 0-16 feet below a prepared work platform. An engineer specified blend of 3% Portland cement and 9% ground granulated blast furnace slag (GGBFS) was produced on-site at the Geo-Solutions batch plant. 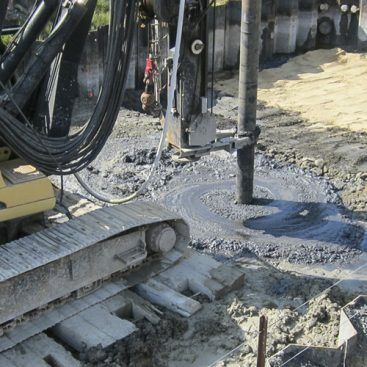 Solidification was performed with a standard Komatsu 360 and a Kobelco 350 hydraulic excavator. 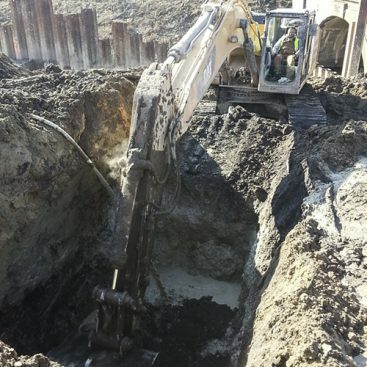 The working platform was prepared by others with a sheet pile wall and gravity wall installed along the perimeter of the site, which was then excavated to approximately 14 feet below original ground surface by CEI. ISS was divided into 4 sections, P cells, or inner cells, raker cells, against the sheet piling, and A and B cells, adjacent to the gravity wall. 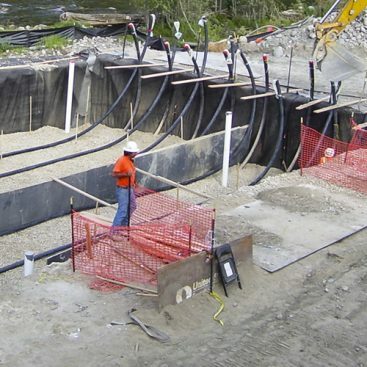 ISS had to be completed in a specified sequence in order to allow for the installation of dead men sheet piles in the P cells which would serve as anchors for stabilizing supports, or rakers, along the sheet pile wall during excavation of the R cells. Installation and location of the raker supports further limited the available work area for ISS. A and B cells were also required to be completed in a prescribed manner to limit any impact to the integrity of the gravity wall. Cell dimensions in the interior of the site were typically 10’x15’, while R cells were typically 20’x20’, with some cells being smaller or irregularly shaped to ensure 100% coverage of the mix area. While the spatial limitations of the site were the biggest challenge with this project, material deliveries were also a key factor. The project is located in downtown Newark, New Jersey on a main thoroughfare. Scheduling deliveries and staging trucks such that they would not impede traffic was paramount. Additionally, with materials being shipped Philadelphia, weather and road conditions had significant impacts to production and schedule. 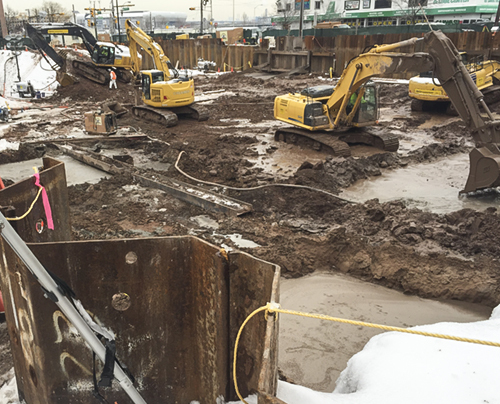 Additional challenges were the wet ground conditions, further exacerbated by the limited working area, high groundwater table, winter weather and limited available daylight. While the reagent addition rates were specified by others, Geo-Solutions was responsible for overall quality control of the stabilization activities which included process controls to ensure accurate reagent blending and reagent addition rates. The horizontal and vertical limits of the ISS work were verified by total station survey equipment during execution of the work. Perform ISS as a basis of site remediation for the Former Market Street Gas Works. Meet the performance standards for strength of 50 psi minimum and a maximum hydraulic conductivity of 1 x 10-6 cm/sec. Stabilized approximately 17,700 cubic yards of soil. Limited work area and coordination of ISS with steel support installation. Material deliveries without impeding traffic. Delayed deliveries during inclement weather.